The events which led to the North Berwick Witch Trials began, not in Scotland, but at the other side of the North Sea. The frenzy began with a hysterical Danish Admiral, during a great sea tempest he blamed on witchcraft. The accusations leveled at those on trial ‘uncovered’ a plot against King James VI of Scotland, later to become King James I of England. The King was to take part in the hearings and his response was to change the course of how those charged with witchcraft were tried for the next one hundred years. The names of commoners, who would normally pass through mortality with little written records left to testify of their existence, suddenly found their named entered into history books: names like Geillis Duncan, Agnes Sampson and Agnes Thomson. Even the rich and educated were not immune. John Fians, a school teacher at Prestonpans, was implicated as was the Earl of Bothwell. The North Berwick Witch Trials revealed a dark and cruel side to James’ nature, and yet this was a highly intelligent King, an intellectual. But what led to the events that resulted in one of the darkest moments of Scotland’s dark history? Some of the answer lies in events that began before the king was even born. As the tempest raged off the coast of Denmark in 1589, tensions were already running high in Scotland. The storm was the spark which would result in the deaths of some seventy people during the course of North Berwick Witch Trials of 1590-92. Sixteenth Century Scotland was a tempestuous place. As the Protestant Reformation spread across Europe, like a tidal wave, a corresponding flurry of witch hunts flooded the continent. These were the holocausts of their time. Scotland would not be immune. The burning times had arrived! 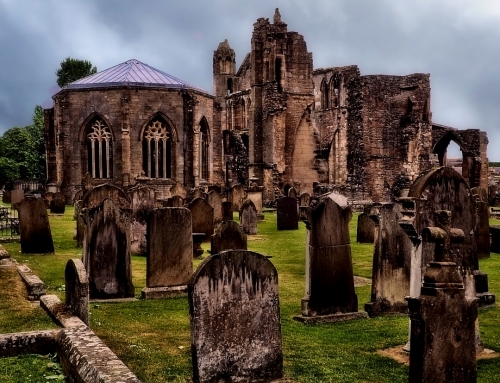 At the turn of the 16th Century, Scotland was still deeply loyal to the Catholic Church. Socially the Church had played a major role in many Scots lives. Only baptised members of the Church could be married or at the end of their lives, be buried in consecrated ground. But the Church provided far more to its parishioners. The Church was the principle healthcare giver. Since medieval times, Catholic monks had run the various hospitals, infirmaries, leper houses, alms houses and bede houses in Scotland. Scotland is a land of sea lochs and firths. Traveling by road alone, could have added days to a journey but the church provided a vital service by running most of the ferry services at this time. In addition, travelers benefited from the hostels which the Church operated. Many of the breweries and meal mills were operated by the Church, thus making the Church literally the ‘bread of life’ for many of its flock. Education also came under the auspices of the Church, with Scotland’s first three universities gaining their charters through Papal bulls. However, the church was also important on an individual level. It was the vehicle through which eternal salvation depended. Changes to its forms of worship could jeopardise the fate of the soul. Until the Reformation, the Bible and other religious texts were written in Latin and were accessible only by priests, monks, bishops and popes. Much of the angst towards the Catholic faith had occurred, as many joining the Clergy did so as an opportunity to gain personal power and wealth. Because of this, most of the power base of the Medieval Church depended on the ignorance of the people. Only Clerics could explain the great mysteries of God. Interestingly, the official stance of the Catholic Church was to deny that witchcraft even existed. It was viewed as a silly superstition and the Church insisted that there was no power in it. The Catholic Church did punish heretics and the practice of Witchcraft could be deemed heretical. However, there were few incidents of witches being tried in Medieval times. The Catholic Church had been tolerant of local festivals and allowed and even encouraged the worship of local deities to be modified into the Cult of the Saints. This enabled folk customs and beliefs to continue to some degree. As the 16th Century progressed, an increasingly educated populace sought more personal forms of spiritual experience. At the dawn of the Enlightened Era, Rome and its doctrines were not always up-to-date with the needs of a country which was rapidly embracing the modern world. Education, it seemed, was the catalyst to breaking what some saw as the stranglehold the Catholic Church had over its congregations. When Lutheran books began to appear in Scotland, their radical message struck a chord with many of the Scots. King James V tried to ban the books, but like a forbidden fruit, this only fueled the curiosity of those seekers of knowledge. The Reformation ushered in a new brand of intolerant thinking. The Catholic Church was labelled as idolatrous and pagan. The world suddenly became black and white, where a war was being waged between good and evil. Satan and his demons were everywhere, and their mission was to take down good Christians through his emissaries, the witches. It was a time of doctrinal insecurity. Suddenly the unexplained was no longer explainable and it heightened the fear of witchcraft. In 1563 the Scottish Witchcraft Act made both witchcraft and the consulting with witches a capital offense. However, it was not until the North Berwick Witch trials that the killing really began. After Henry VIII, King of England, converted to Protestantism, James V, in urgent need of money to support his Scottish royal court’s extravagant lifestyle, cunningly dipped his toes into the murky water of the Reformation. His goal was to scare the Pope into granting him tax concession, and he was not alone in flirting with Protestant ideas for financial gain. Many of Europe’s political elite saw the adoption of the Protestant Faith as a way of bypassing high Papal taxation and seizing the vast clerical wealth within their kingdoms. In 1542 James V died, leaving a sole heir, the week-old Mary Queen of Scots. Scotland was plunged into a crisis. Both England and France saw an opportunity to grab control of the Scottish throne by marrying the young queen. England was Protestant, France was Catholic. In their bitter power struggle over Scotland, the issue of Scotland’s religion became more than a question of Scotland’s faith, but one of international power politics. However, with the young queen having a French mother, the power plays were easily decided. The young Mary was sent to France and became the child bride of the Dauphin, heir to the French throne. Meanwhile, the Protestant reformers broadsided both the French and English religious leaders. They adopted a Presbyterian system which rejected most of the trappings of the medieval church. This was not the conservative reformation of England but a massive rejection of the old religious traditions. Scottish reformers like John Knox saw the world in black and white and were intolerant of the shades of grey between. Without the consent of their sovereign, the Scottish Government declared Scotland to be Protestant and Catholicism was banned. Mary Stuart, otherwise known as Mary Queen of Scots, is perhaps one of the most well-known figures in Scottish history. During her lifetime, Mary had numerous enemies. There is a tragic quality about her life that engenders a sense of romance in those who explore her story. Young Mary had been born and raised a Catholic. When the Dauphin died, she returned to the land of her birth, a land which was still charting its way through the Reformation. Having lived in France since the age of five, she had no real knowledge of the dangerous and complex political structure of mid-16th Century Scotland. She worked out a compromise with the government which allowed her and her retinue to practise the Catholic Mass, while it remained illegal throughout the rest of Scotland. However, many of her subjects eyed her with suspicion: the Protestants because they feared she would re-instate Catholicism as the official religion of Scotland, and the Catholics who felt betrayed that she had not done enough to further their cause. John Knox, the great leader of the Scottish Reformation, condemned Mary for celebrating the Catholic Mass. Tensions heightened when Mary married her first cousin, Lord Darnley, who was also Catholic. The match was not viewed favourably by either the Scottish Protestant Nobles nor by Elizabeth I of England, who felt threatened as the couple now had a claim to the English throne. Elizabeth had come to the throne by default. Henry VIII had executed her mother, Anne Boleyn, had their marriage annulled and then declared that their daughter Elizabeth was illegitimate. Elizabeth’s Catholic subjects were only too ready to believe that their Protestant sovereign had no real claim to the throne and to look to the north for an alternative to the Crown. Meanwhile, Mary’s marriage to Darnley was not a happy one. Darnley wanted to be more than just husband to the Queen of Scots. Ultimately, he would form an allegiance with the Scottish Protestant lords which would culminate in the murder of David Rizzio, Mary’s Catholic secretary, an act which was blatantly carried out in front of the pregnant queen. Mary and Darnley’s son James, was born a few months later on the 19th June 1566. In January 1567, Darnley was also murdered, and it was generally believed that the murder was carried out by the Earl of Bothwell. Bothwell was acquitted, and he married the queen in May 1567. The marriage was unpopular among the populace and ultimately would result in Mary’s downfall. She was captured and imprisoned by her own people and forced to abdicate in favour of her thirteen-month-old child, King James VI. She escaped from Scotland only to be imprisoned and finally executed by her cousin, Queen Elizabeth I of England. Mary had hoped that her separation from her child was temporary. Little did she know it would be the last time she would see her babe. The young King James VI of Scotland, later to become King James I of England, was essentially left an orphan. He was raised by people hungry for both religious and secular power. His tutors were specially selected from those with a strict Protestant mindset. George Buchanan, the young king’s senior tutor, subjected James to regular beatings, but also instilled in him a lifelong passion for literature and learning. Buchanan sought to turn James into a God-fearing, Protestant king who accepted the limitations of monarchy, as outlined in his treatise ‘De Jure Regni apud Scotos.’ James was also encouraged to despise his own mother for her treachery and loyalty to Roman Catholicism. However, Buchanan was only partially success in these aims–James disagreed with him about the limitations of monarchy. Scotland was governed by a series of regents until James VI came of age. Many of these were killed or died under mysterious circumstances. Catholic plotters would eventually plan the Gunpowder Plot, a famous failed assignation attempt on the young King. Even in his early years an attack on James’ life got so close that he grappled with the would-be assassin in his chambers. For the young King, fear of assignation was a phobia; it was a reality. The early events of his life were to have a profound effect on the King. In many ways he was an admiral monarch; he started the first postal service in the UK and he translated what was to become the definitive English version of the Bible which is still in use today. He was considered to be an intellectual with a sharp mind, who took a keen interest in many subjects. However, this interest could become obsessional. For instance, he became so consumed in hunting down certain stags that he neglected some important crown business. He had little or no interest in women and preferred to surround himself by men. There have been some suggestions that these relationships went beyond the platonic. James’ beliefs had a dangerously misogynistic core. He grew up to scorn women. This was one of the symptoms of the Reformation. The Catholics had deified Mary, as the mother of Jesus. The Protestants looked on women as being weak and easily misled, like the fallen Eve who was beguiled by the serpent in the Garden of Eden. Severe Protestant preachers of the time, like John Knox, certainly influenced his view of the world. He had a peculiar bind-spot when it came to witches, which was both irrational and cruel. It is unimaginable to adequately comprehend the horrific torture and suffering to which the accused witches were subjected before being burnt for crimes they could never have committed. His mother’s violent death seems to have resulted in James’ dark fascination with magic. The author John Harington wrote,” His Highnesse tolde me her deathe was visible in Scotlande before it did really happen, being, as he said, ‘spoken of in secrete by those whose power of sighte presented to them a bloodie heade gancinge in the aire’”. Did his lack of an immediate family make it difficult for him to be emotionally available for his wife or rob him of empathy for his subjects? It seems likely that he would have suffered from some kind of attachment disorder, given the circumstances of his early childhood. Did a lack of a strong female presence cause him to mistrust women? Was his obsessive personality a symptom of some deeper psychological issues? We do not know the answer to these questions. What we do know is precisely when his obsession with witchcraft began. The year was 1589, when King James traveled to Denmark to retrieve his new bride. His betrothed, Anne, the daughter of Frederick II of Denmark, had set off for Scotland, but her ship was forced to turn back so James made the gallant effort of setting sail to fetch her. It is important to bear in mind that Denmark was also undergoing a Reformation and had already began its own witch hunts. James and Anne were on their way back to Scotland when a most ungodly storm began. As the swell began to batter the fleet, the fearful Danish admiral declared that the cause of the storm was witchcraft. He believed that it was caused by the wife of an administrator he had insulted. It seemed that James’ vessel was jostled more than the others. The fleet limped back towards the shore and took refuge off the coast of Norway. James had recently met with a Danish Lutheran theologian and expert on demonology, Neils Hemmingsen. His recent education about the dangers of witchcraft convinced the King that the accusations must be true. Soon after witch hunts were launched in both Scotland and Denmark. Anna Koldings was found guilty and executed by burning at the stake at Kronborg, along with another twelve women. News of the outcome of the trial was sent from Denmark to James in Scotland. James then decided to begin a witch hunt of his own in Scotland. Barbara Napier: the widow of Earl Archibald Douglas 8th Earl of Angus. She was accused of bewitching her husband to death. Archibald was said to have died of a disease so strange that there was no remedy or cure for it. Geillis was eventually strangled and her body burnt. 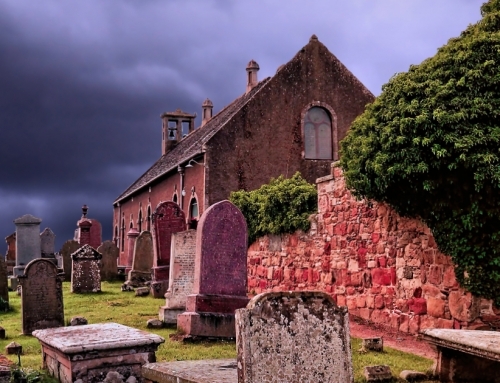 The North Berwick Witch Trials uncovered a massive plot against the king, whereby a coven of some two hundred witches traveled to St Andrews Auld Kirkin in North Berwick, to meet by night. Their meetings were presided over by none other than the Devil himself, for apparently James VI was the Devil’s greatest enemy in all the world. 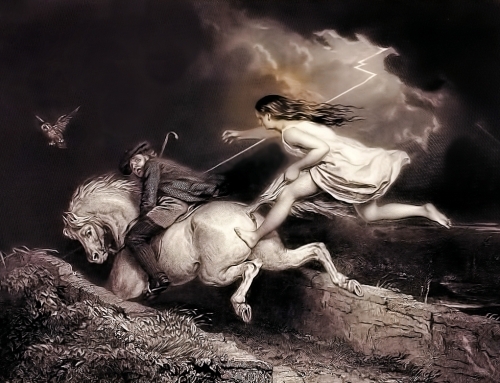 The witches allegedly began their plot with the use of weather magic, first to stall Anne’s departure and then to disrupt James’ return. Gellies confessed to meeting a Danish witch to concoct their plot. So fantastical were the confessions that King James did not initially believe them. However, that was about to change. As an intellect, James was a naturally curious person. 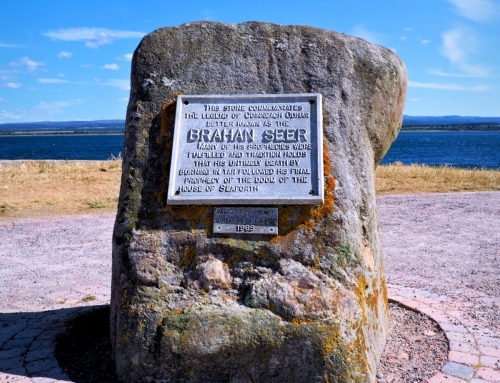 He decided to attend the North Berwick Witch Trials in person, which was unusual for a monarch. 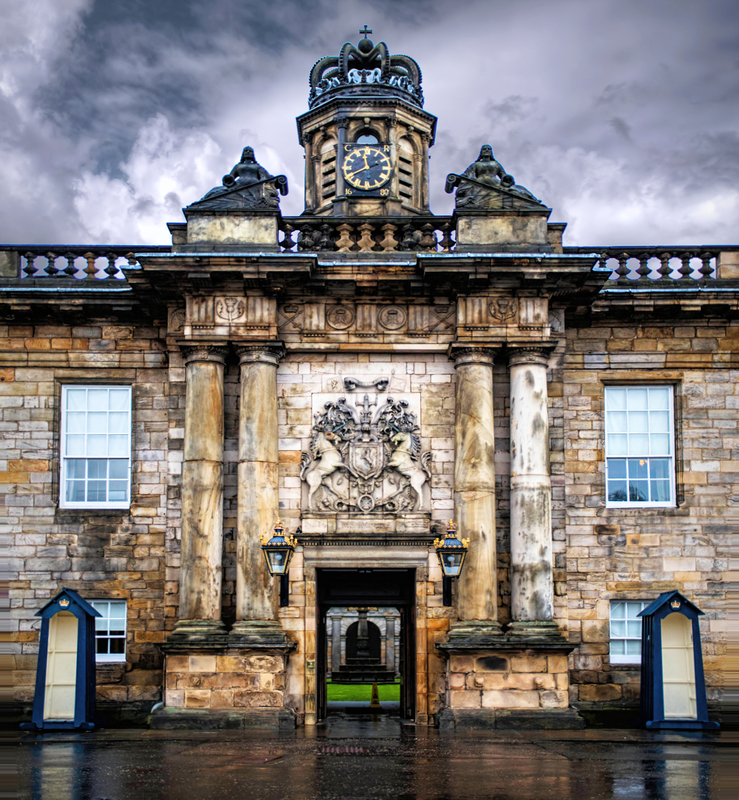 At first, he was sceptical, until one of the accused, Agnes Sampson, was brought before him at Holyrood Palace. Agnes beckoned the King to come close, so she could whisper in his ear. She revealed private details about James and Anne’s wedding night, details which should have been impossible for her to know. The King was convinced. Only a witch through her Satanic associations could come by this knowledge. From this point onward, James was an avid believer in witchcraft. Then again, it should be noted that during this time, royal wedding nights were not private affairs. The consummation of the royal marriage bed was a public event, witnessed by important personages at court. Witnesses were seen as a necessity, because so much hinged on royal marriages. It is not beyond the realms of possibility that some royal courtier had a loose tongue and that the salacious gossip had spread throughout the local peasantry. But why would Agnes use this information against herself? Perhaps simply to end the ordeal once and for all. Agnes was subjected to severe torture. Initially she had denied any of the charges brought against her, but then came her time in the dungeons. Remarkably Agnes was able to endure her ordeal for days without confessing. After having all hair shaved from her body, she was forced to stand naked, fixed against a wall by a witch’s bridle. This device was an iron muzzle in an iron framework which enclosed the head. Four sharp prongs were forced into the mouth, so two prongs pressed against the tongue and the other two against the cheeks. She stood like this for days without sleep or food. Agnes would not be easily broken. Frustrated by Agnes’ resilience, her jailers increased the level of torture and deployed the use of a garrott. Within an hour of having the noose placed around her neck and tightened, Agnes had confessed to the fifty-three indictments against her, the chief of which were treason, consorting with the devil and witchcraft. On the 16th of January 1891, Agnes was taken to the scaffold on Castlehill, where she was garrotted then burnt at the stake. Horrific means were used to torture the accused during the North Berwick Witch Trials. The witch’s bridle was only one of the torture devices used. Other devices included the ‘breast ripper’ which did exactly as it sounds. Sleep deprivation was an effective means of torture and the very nature of the results played into the hands of the torturer. These tormentors would keep the accused wakened for hours or days on end, causing their victim’s body and brain to eventually ‘reset’ itself by manually shutting down. In other words, one would start dreaming while in an awakened state. The hallucinations brought on by lack of rest would easily convict these individuals as they would start to see ‘visions’ and fantastical imagery, making the prosecutors believe that the individual was simply a witch invoking their magic and confessing to the deeds committed. Another horrific account was that of Dr. John Fians. His torture included having his fingernails forcibly extracted, then having iron pins thrust therein, the thumbscrew, and the boot to crush his feet until they were so small that he was left crippled. He was reported to have endured the torture without expressing pain. In the end he was tricked into confessing that he was in league with the Devil. He was finally taken to the Castlehill in Edinburgh, placed in a cart, strangled, and burnt on 27 January 1591. Sailing up the Firth of Forth in a sieve, to Saint Andrews Auld Kirk in North Berwick for gatherings with Satan. Collecting venom from a black toad, to be used to poison the King. Some seventy people were accused during the North Berwick Witch Trials. It is unknown how many were executed. It is likely than some died while under torture. This was Scotland’s first major witch hunt. It was certainly not the last. Approximately 3100 people would be accused of witchcraft in Scotland in the coming years. More than 1300 would be executed. ‘What can be the cause that there are twentie women given to that craft, where ther is one man? ‘What can be the cause that there are 20 women given to that craft [witchcraft], where there is one man? During the translation of the King James Bible, James had the word for a sorcerer, changed to the female form witch. Is it any wonder that most of the people accused of witchcraft during the Scottish Witch Trials were women? At which point they promise to conjure up a storm. The tormented ghost of Agnes Sampson is said to roam the hallways and corridors of Holyrood Palace, tortured, naked and bald to this day. Sightings of Bald Agnes date from the time of her execution through to the modern day. In 2014, a maintenance man was working late, trying to repair a faulty lock. He is said to have seen the spirit of Bald Agnes appear at the end of a well-lit corridor. She proceeded to limp in his direction with slow, agonised movements. Startled, the worker let out a scream of terror at which point the ghost disappeared. Another sighting of Agnes is said to have taken place in the 1990s during a visit by the Chancellor of Germany. The unfortunate witness was a young German diplomat, who was seen running out of an office in fear. When he was questioned, he responded that he had seen a naked and transparent apparition floating mid-air with outstretched arms. One cannot help but wonder if Agnes’ apparition ever appeared to King James in his Holyrood home. It certainly would be poetic justice for the role he played in the North Berwick Witch Trials. Perhaps it explains why he so readily left Holyrood and took up residence in London when he succeeded to the English throne.